Hasselback potatoes (aka accordion potatoes) are the perfect potato for a grand presentation without a lot of work. In fact, these spuds require little more than your average baked potato. The name Hasselback has it’s origins in Stockholm, Sweden at a restaurant called Hasselbacken. 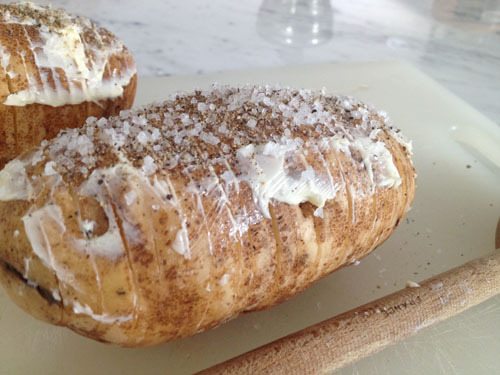 Hasselbacken opened it’s doors in 1748 and there, these delicious spuds are referred to as hasselbackspotatis. Now try saying that 3 times fast. 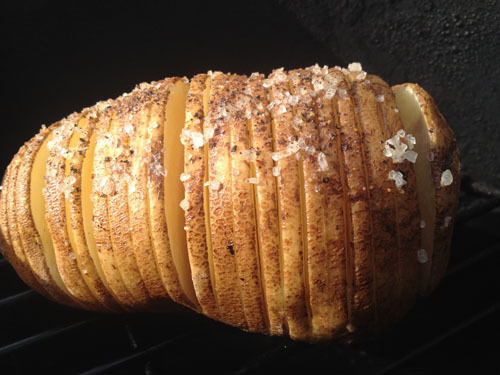 Despite the fancy name, Hasselback potatoes are a really simple dish, and in the most basic form; are nothing more than whole potatoes cut in such a way as to resemble a fan or accordion when roasted. The slicing allows the potatoes to get extra crispy on each “fan” but still maintain a creamy interior – almost french-fry like. You can use any variety of potato that you wish – though medium sized potatoes are going to be a whole lot easier to work with. Just don’t use super-sized potatoes – remember that each potato is going to be a single serving and you don’t want to overwhelm your guests. Egg Setup: These potatoes can be done either with direct or indirect (using the plate setter) methods. I set my BGE up for direct heat because I was going to do steaks as well – so set it up as you wish. 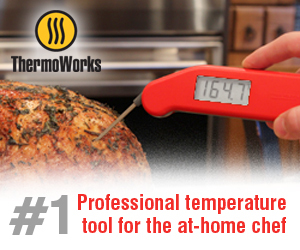 The main thing that you are going for is a temp of 400-450 – with no flare ups. 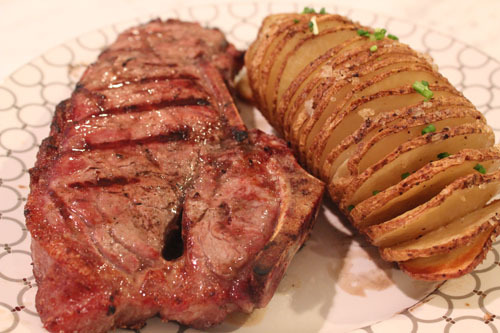 This means if you are cooking direct, you are going to need to start the BGE about 30 minutes (or more) before you put the potatoes on – allowing the egg to come to temp and the coals to settle in for a nice cook. Because I was using regular russet potatoes for my Hasselbacks, the prep was really simple: scrub the skins with a sponge and let air dry. 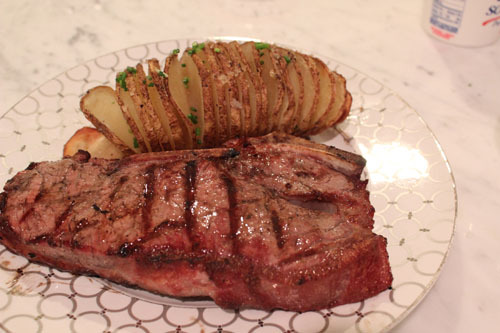 Once dry, the potatoes are then sliced into ¼” slices, ¾ the way through the potato. 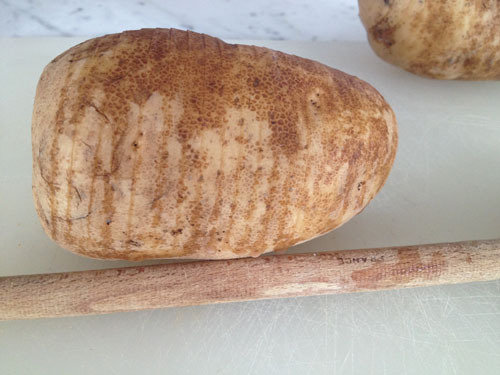 Pro Tip: Place a wooden spoon beside the spud to act as a guide – this will help prevent you from cutting all of the way through and will help maintain a uniform fanning of the Hasselback. Once you’ve sliced the potatoes and hopefully not your fingers, now you are to rub butter on the potatoes, getting in between the slices where possible and then season with salt and pepper. You will also season again ½ way through the cook, so don’t worry if you can’t get every slice (don’t risk breaking the spud). Pro Tip: Place a wooden spoon beside the spud to act as a guide. 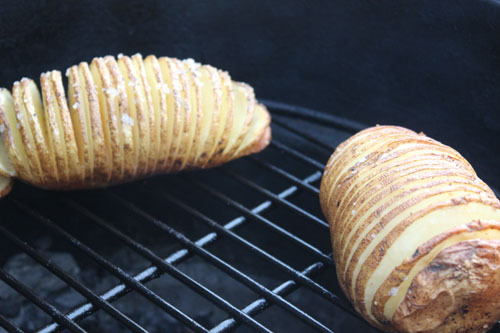 Once you’ve prepped the Hasselbacks and have your BGE at temp (remember, holding steady at 400-450 with no flare ups), simply place the potatoes on the grill (no foil!) and close the dome. Don’t open that sucker up for another 30-45 minutes. Pop open a beer and move on to prepping the rest of your meal (unless you are only eating potatoes). After 30-45 minutes, open the dome and admire your handy work – by now the spuds have begun to beautifully fan out and are actually starting to look like the fancy ones we’ve all seen before. Pro tip: 1/2 way through the cook – add more butter! Pro Tip #2: At the half way point of your cooking time – apply a second round of butter. Melted butter will be much easier to drizzle over the heat of the Egg – just don’t douse them with so much it spills over and causes flare ups. Once the 2nd round of butter is applied, close the dome again and let the Hasselbacks cook for another 30-45 minutes or until done. Because these are not wrapped in foil, they will take a bit longer then a baked potato – just keep that in mind. Once the Hasselbacks are done cooking, you can dress them any way you please. For mine, a little sour cream and chives did the trick perfectly – then just eat and enjoy! 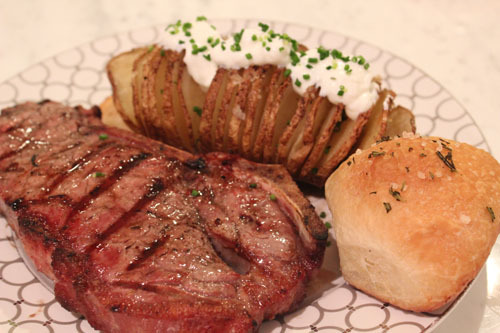 Hasselbacks & Steak – good thing my cardiologist doesn’t read this blog! 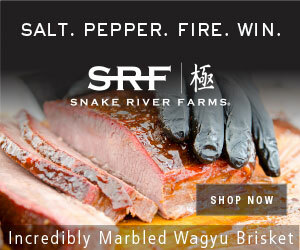 Check out the perfect Sunday dinner pair! Turned out great. If using course kosher salt hit it hard. Thank you. This looks great. I am an English Egg novice and am loving the forums. Really inspirational. Three meals so far. Now keen to get more ambitious. I have invested in a Dutch oven – any recommendations for a simple first recipe in it? Thank you.